GPA is a STEAM influenced school. Although we follow our QCUSD curriculum meeting state standards through a mastery learning program, at GPA we do use a STEAM influence in many ways. You will be invited to events at school in which students show off and interact with STEAM such as our Night of the Open Door. Look for our upcoming events to see how STEAM is highlighted. 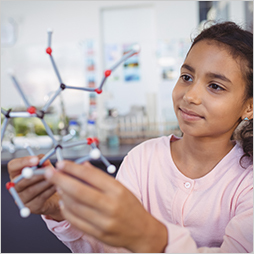 On a more regular basis, teachers will include STEAM activities in daily lessons. Opening in the fall of 2018, GPA will also have a Makerspace. This classroom will be available for all teachers and will support learning for kindergarten students through our fifth graders. Students will be able to build, create, and follow the engineering design process through the use of this room. Students will use all forms of building materials from computer programming to Legos to cotton balls and popsicle sticks. Our goal is to continually grow this space as the world changes to provide our students with both foundational design and creative skills but also skills to prepare for the future. Our teachers have access to and continually discover new technology tools. Some that you will see your students interacting with are: Moby Max, Typing Club, Interactive Lessons, Code.org and the Hour of Code, Scratch, Extra Math, Khan Academy, tablets, laptops, computer lab, and so many more.